"You have a rendezvous with destiny!" – promised Major Gen William Lee to his men as the 101st Airborne Division was activated at Camp Claiborne, Louisiana, 15 August 1942. And the first place they kept that rendezvous was Normandy . 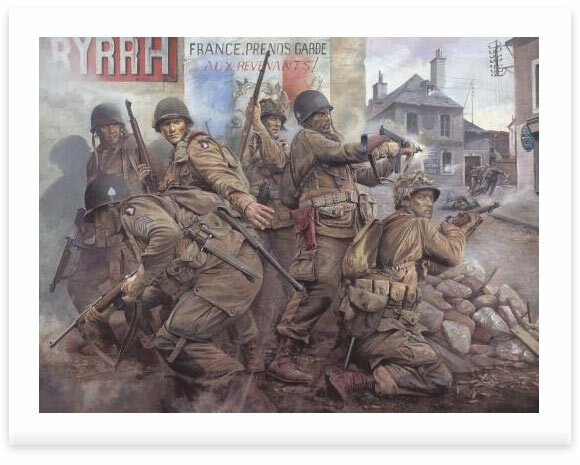 . ."
This dramatic new limited edition by Chris Collingwood, one of Britain’s foremost figure artists, portrays the men of Easy Company as they fight their way through the bullet-swept streets of Carentan. Facing the enemy in close combat house-to-house street fighting, the paratroopers relentlessly pounded the enemy until the last vestiges of German resistance were overwhelmed and the objective taken. But for the men of Easy Company and the 101st Airborne, this action is just the beginning of their distinguished but savage war. Others will follow: the liberation of the first Dutch city, Eindhoven; the siege of Bastogne during the Battle of the Bulge; and ultimately, the capture of Hitler’s ‘Eagles Nest’ at Berchtesgaden. Published in tribute to the paratroopers of the 101st Airborne Division who spearheaded the D-Day invasion in June 1944, five distinguished Easy Company veterans who fought with this courageous outfit in World War II have personally hand-signed each print, giving a special credence to this remarkable edition. Chris Collingwood is perhaps the finest military portrait artist of his generation. The chance to acquire a piece of original artwork from an artist of such international repute is an extremely rare opportunity not to be missed. In close collaboration with the Military Gallery, the artist will personally remarque two very highly restricted editions of THE TAKING OF CARENTAN for collectors.